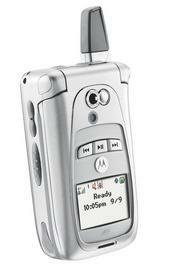 The long awaited Motorola i870 has officially been announced by Motorola. The feature packed handset is the first in the US to ship with a antimicrobial coating (this is more popular in Asia). You should be able to find the i870 starting today through all distribution channels. Online it's priced at $299 with contract. Click on image at right to zoom. Two more images of the i870 are available below.